The Cuban Missile Crisis was a time of heightened confrontation between the Soviet Union, the United States, and Cuba during the Cold War. In Russia, it is known as the Caribbean Crisis (Russian: Карибский кризис, Karibskiy krizis). Cuba calls it the October Crisis. It was a proxy conflict around Cuba. It happened when the Soviet Union (USSR) began building missile sites in Cuba in 1962. Together with the earlier Berlin Blockade, this crisis is seen as one of the most important confrontations of the Cold War. It may have been the moment when the Cold War came closest to a nuclear war. There was a coup in Cuba in 1959. A small group led by Fidel Castro took power in this Cuban Revolution. The new government took over American businesses. The American government refused to import anything from Cuba after that. The US embargo against Cuba began February 7, 1962. In 1962, the American government was worried that the USSR would attack America from Cuba, because Cuba is near enough that the missiles could reach almost any city in America. Cuba was seen by the US as a Communist country, like the Soviet Union. In October 1962, American ships blocked Soviet ships carrying missiles from going into Cuba. The Soviets and Cubans agreed to take away the missiles if America promised not to attack Cuba. During the Cuban Missile Crisis, the Kennedy administration secretly agreed to remove the Jupiter missiles from Turkey in exchange for the withdrawal of all Russian nuclear weapons from Cuba. However, it is not decided if anyone "won". The USSR lost China's support over it. The half-hearted invasion left Soviet premier Nikita Khrushchev and his advisers with the impression that Kennedy was indecisive and, as one Soviet adviser wrote, "too young, intellectual, not prepared well for decision making in crisis situations... too intelligent and too weak." In late 1961, Kennedy launched a number of covert operations against Castro's government. Named Operation Mongoose, they were unsuccessful. In February 1962, the US launched an economic embargo against Cuba. In September 1961, the Cuban government thought the US would invade because of a resolution by the US Congress to allow military force if the interests of the US in Cuba were threatened. The US also announced a military exercise in the Caribbean to be held the following month. Castro and Soviet premier Nikita Khrushchev agreed to place secret strategic nuclear missiles in Cuba in case the US invaded. Like Castro, Khrushchev thought that the US would invade Cuba soon and that for Cuba to stop being a Communist country would hurt his reputation around the world, especially in Latin America. He said that he wanted to confront the Americans "with more than words.... the logical answer was missiles." Tensions were at their highest from October 8, 1962. On October 14, United States reconnaissance saw the missile bases being built in Cuba. The crisis ended two weeks later on October 28, 1962, when the President of the United States John F. Kennedy and the United Nations Secretary-General U Thant reached an agreement with the USSR to destroy the missiles in Cuba if the US agreed to avoid invading Cuba. Khrushchev wanted the Jupiter and Thor missiles in Turkey to be removed. The US removed them but forced Khrushchev to keep that a secret. In Cuba, Fidel Castro took power from General Batista on January 1, 1959. From 1952 to 1959, Batista was a military dictator in Cuba, very right-wing with Mafia connections & the support of the Eisenhower administration. The United States was interested in Cuba because of the many businesses that they had there, even though the country was a dictatorship. The countries were also military friends. This was shown by the US base at Guantánamo Bay. When Castro came to power in Cuba, he nationalized American companies in Cuba, meaning he took the private property from those companies and made it the property of Cuba, to use as Castro decided. The United States decided to break off economic relations with Cuba (which means that they would stop buying things from them). They stopped American foreign aid going to Cuba, and stopped buying Cuban sugar (which was Cuba's main export). This was a disaster for Castro, because America bought the most Cuban sugar. However, Russia saved the Cuban economy by buying Cuban sugar for high prices. Castro turned to the USSR, a great power. He signed a contract with Nikita Khrushchev, the Russian chairman at the time. The contract said that the USSR would buy 1 million tons of Cuban sugar per year, in exchange for Castro's Communist support; he declared himself a Marxist-Leninist on December 2, 1961. He wanted a chance to get the American missile sites out of Turkey, which was close to Russia. When Kennedy found out about the missile sites on October 16, by sending a United States Navy U-2 Spy Plane to take pictures of Cuba, he saw the missile sites and thought the worst: that Cuba was preparing to attack the United States. The US was angry when they found out about the missile sites. 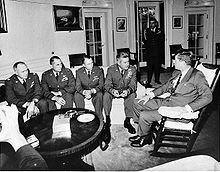 Kennedy's advisers did not think that the missiles were ready when they first saw the pictures but thought that they would be ready in less than two weeks (that gave the name of the movie and the book, called 13 Days). Do nothing Avoids any immediate war Kennedy would look weak to the USSR and the rest of the world. Leaves active nuclear missiles very close to the US. Attack Would destroy most missile sites. Lots of soldiers would die and Cuba could launch nuclear missiles at the US, killing millions of people and thus causing a war between the US and the USSR. Diplomatic pressure Would avoid a war and might convince USSR to remove the missiles The USSR would probably not give up and could end up by making it look more powerful than the US and its allies. Blockade No casualties. Would make it difficult for the USSR to send military equipment (like missiles) and other supplies. The missile sites that were already in Cuba would still be there. A blockade is also an act of war and could start a real war against the USSR. On October 20, Kennedy chose to blockade Cuba to stop all ships going there, rather than listen to his advisers, who wanted to attack. The USSR's first ships arrived at the blockade on October 25 and were turned down. “ Everyone needs peace; both capitalists, if they have not lost their reason, and still more, communists. War is our enemy and a calamity for all people. If indeed war should break out, then it would not be in our power to stop it, for such is the logic of war. I have participated in two wars and I know that war ends only when it has rolled through cities and villages, everywhere sowing death and destruction. I should like you to agree that one cannot give way to pressures; it is necessary to control them. If people do not show wisdom, then in the final analysis they will come to a clash, like blind moles, and then reciprocal extermination will begin. If you have not lost your self-control, then Mr. President we and you ought not now to pull on the end of a rope in which you have tied the knot of war, because the more the two of us pull, the tighter the knot will be tied. And a moment may come when that knot will be tied so tight that even he who tied it will not have the strength to untie it. And then it will be necessary to cut that knot. Khrushchev was saying that he would remove the missile sites if President Kennedy promised not to invade Cuba. An invasion of Cuba would make Khrushchev look bad and could also lead to a nuclear war. This was the reaction that Kennedy wanted. The very next day, a second letter was sent from Russia to Kennedy. This one looked more official than the first. It also said that the US must take its nuclear missiles out of Turkey if they wanted Russia to take their missiles out of Cuba. This would have been a fair trade because the US missiles in Turkey were close enough to Russia that they could reach most of the important cities and Cuba was close enough to the US that the Russian missiles would reach most of the important US cities. The problem for Kennedy was that he could not publicly agree to remove the US missiles from Turkey because Turkey would then not be protected and would not be happy. Another problem was that Kennedy and his advisers did not know if Khrushchev was still in power. They thought that someone in the Russian government might have overthrown Khrushchev. They thought this because the second letter was so much different than the first. Kennedy decided to send a secret message to Khrushchev saying that they would remove the missiles from Turkey in a few months as long as they did not tell the public about it. Kennedy then sent an official letter to Khrushchev agreeing to the conditions of the first letter and not mentioning the second. Khrushchev agreed to the secret message. On November 1, the missile sites were removed, and the problems were over. A communist country was closer to the United States. Cuba came out of the crisis still a communist country. Kennedy was pushed in the crisis. In the end, his desire for peace was important to ending the crisis. The missile sites in Turkey were removed, but not in the way that Khrushchev had wanted. The United States saw Kennedy as the hero who had fought Communism and won. ↑ B. Gregory Marfleet (2000). "The Operational Code of John F. Kennedy During the Cuban Missile Crisis: A Comparison of Public and Private Rhetoric". Political Psychology 21 (3): 545. ↑ 2.0 2.1 Absher, Kenneth Michael (2009). Mind-Sets and Missiles: A First Hand Account of the Cuban Missile Crisis. Strategic Studies Institute, United States Army War College. http://www.strategicstudiesinstitute.army.mil/pubs/display.cfm?pubID=935. ↑ The American Presidency Project. "Proclamation 3447–Embargo on all trade with Cuba". ↑ "Revelations from the Russian Archives". ↑ "Interview with Syndey Graybeal -29. Jan 1998". CIA Documents on the Cuban Missile Crisis, 1962 (.pdf, 354 pgs.) U.S. Central Intelligence Agency, McAuliffe, M. ed., CIA History Staff, 1992. This page was last changed on 9 April 2019, at 22:40.